Ever since his days of going to Baylor football games with his father, Ed Crenshaw knew Baylor was the place for him. Born in Mineral Wells, Texas, Crenshaw lived in Waco from age three to 12 before moving to Fort Worth and then Austin. "When it became time to choose a college, that connection was still there, and really there was never any doubt in my mind where I would go to school. It was always Baylor," says Crenshaw, a philanthropist and CEO of the Florida-based Publix Super Markets chain, which perennially makes the list of Forbes Most Admired Companies. With expected sales of $27 billion this year, the privately owned Publix chain has more than 150,000 associates in 1,052 stores across five states. As a member of Kappa Omega Tau and president of Student Foundation while a Baylor student, Crenshaw says those organizations' emphasis on relationship building still serves him well today. "As a KOT pledge, we had to go out and meet people and get them to sign our pledge book," he remembers. "There was a real emphasis on learning people's names and something about them. There was a real purpose in setting up these introductions, carrying on conversations that allowed you to recognize the importance of people. That is something that has always stuck with me, and I think it's certainly served me well. I try very hard to practice this today, even though our company is very large." Crenshaw is also fond of his time with the service-oriented Student Foundation, when he traveled around the state sharing the Baylor story in churches and recruiting prospective students. "We were able to do public relations for the university," he says. "Can you imagine what great experience that is for a college student to go out and do these things? Of course, the most important thing that we did was raise money for scholarships, and it was very rewarding to participate in generating funds for students who might not be able to attend Baylor if not for that financial aid. That was really the beginning of the experiences that helped me learn the importance of giving back. "I like to think that I've continued to do that today in different ways, but it was that experience with the STUFU that sets you on a path to do those things that you'll be doing, hopefully for the rest of your life." Although he has lived in Florida for years, Crenshaw says he is grateful for the many long-lasting friendships established at Baylor. 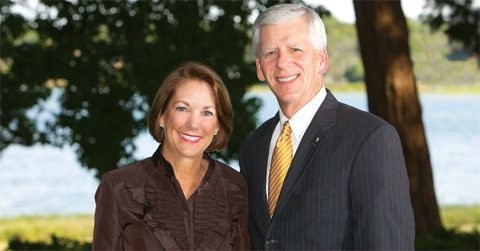 Among Crenshaw's strongest Baylor influences are former Student Foundation Executive Director Bill Harlan and his wife, Nancy, and longtime KOT sponsors Dr. Robert and Joyce Packard. "Dr. Packard is a wonderful person. He and Joyce were very close to all of us. The amazing thing about Dr. Packard was I think he had to be one of the smartest people on the planet, and yet he always made us feel like we were every bit as smart as he was. He always tried to get the best out of every one of his students, and he always had the right words of encouragement when things weren't going well. Still, I don't go to Waco without trying to get together with him." Crenshaw and his wife, Denise, have made giving back not just a habit, but a lifestyle. In addition to providing the naming gift for Baylor's Ed Crenshaw Student Foundation Building in 2005, they also established the Ed Crenshaw Endowed Student Foundation Scholarship that same year. The Crenshaws serve together on The President's Scholarship Initiative Steering Committee and are very active philanthropists with several organizations near their home in Lakeland. Outside of Baylor, Crenshaw primarily has focused on health care needs, serving on the Lakeland Regional Medical Center board of directors. He had a nine-year service term, including serving as chairman of the board. He is chairman of the board of overseers for the Florida Southern College Business School, and he has served on the Lakeland Chamber of Commerce and on a business commission for the Polk County School Board, among others. Crenshaw says that Publix, which his grandfather established in 1930, has a culture of giving back to the community, both through financial giving and volunteering. "We are huge supporters of United Way. For me, I like to think my interest was all started at Baylor, a desire to serve others, and I have to credit KOT, Student Foundation, and really that whole experience at Baylor with instilling that philosophy in me," he says. An alumna of the University of Georgia, Denise Crenshaw is a dedicated volunteer with Lakeland Regional Hospital Foundation and Peace River, a United Way agency that helps women in crisis. She also serves on the board for Guardian ad Litem, which is comprised of volunteers who speak on behalf of abused and neglected children in the court system. "I went to Baylor with Ed several times over the years, and every time I've been back, I'm just amazed at his friends and the people who work for Baylor," she says. "They're all so genuine and friendly, just such positive people. What a unique place to attract and develop such a neat, gracious group of people."